Cuban Vice President recognized the importance of import substitution and expanding national production. 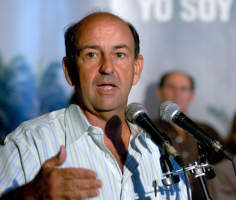 Cubas vice-president of the Council of State, Carlos Lage Dávila, on tour of the islands eastern Granma province, commented on the need for import substitution, increasing investment and expanding national production. At the end of Saturdays journey to review economic and social works in that province, the leader explained that there is currently reanimation underway in strategic sectors, such as in the construction materials industry and sectors of the food production industry. However, he recognized that economic progress must be accompanied by precepts like hard work as outlined by President Raúl Castro, who said, "Not only does this mean more work, but also working better." In the city of Bayamo, Lage evaluated the possibilities of a milk producing facility, one of the most important of the country. In this respect, he explained that that center "has the responsibility of producing the milk supplements for the diets of pregnant women and children with certain illnesses across the entire country." "The objective," he added, "is that those products are never lacking and are delivered within one day." The vice president of the Council of State also criticized the situation of the aqueduct in the city of Manzanillo, which has caused problems in supplying water to the public throughout the whole day. Lage indicated that authorities have made two important decisions: to evaluate what to has been done in successfully fulfilling the initial objective and to analyze in depth the errors made, so as to take steps to remedy these.